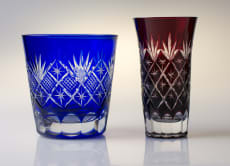 Edo Kiriko offers the unique local cultural experience of cutting and polishing glass using old traditional methods in Tokyo. In our facility you can carve specific local glass patterns and create a wonderful souvenir and memory from your trip to Japan. Glass cutting our own design was a bit difficult, but fun nonetheless! I will definitely like to do it again! It was so far one of the best experience in Tokyo. By trying to make an edo kiriko by ourselves, we came to appreciate more about the art of Edo Kiriko. Also the cups available to buy was of better price compared with buying overseas, was a precious experience making the glass, and I do hope there could be more sessions for more advanced techniques or practice. Nice craftsman who explained the techniques of cutting the glass in details. Enough time for practicing and making the final product. Nice experience and worth to recommend to others. I was a good experience.you will enjoy. But need to practice first, then you catch the tips.